Why did I change such a powerful statement? I believe that it is not only stronger now, it is also truer. See, sociology is just one part of the equation. Social science is the study of society and human behaviors. As an umbrella term, we should think about social media and mobile behavior as it’s related to psychology, anthropology, communication, economics, human geography, ethnography, et al. After all, everything comes down to people. Unfortunately in new media, we tend to put technology ahead of people. Think about your current social media, mobile, or web strategy for a moment. Do you even know who you’re trying to reach? Do you know what customers or stakeholders expect or the challenges they face? Are you familiar with how they connect and communicate and why? Lastly, do you understand the journey they take to make decisions? Whether we do or we don’t isn’t stopping us from embracing social and mobile technologies to reach the new generation of connected consumers. In a Pivot study we conducted in 2011, we asked brand managers and marketers if they had a clear picture of who their Social Consumer is. An astounding 77 percent said yes. When we explored specifically if respondent organizations asked Social Consumers what they expect from engagement, most responded, “No.” This is intriguing because we have 77 percent of organizations who say they know what their Social Consumers want, but 53 percent haven’t really asked. They do not—cannot—really know how to deliver value in social and mobile networks. On the other hand, 35 percent did note that they asked Social Consumers about their expectations. These organizations will most likely outperform organizations that did not ask. There is no good reason or explanation for why we are not engaging or learning from customers. As it stands today unfortunately, the chart above says everything about how businesses see and value customer relationships. This.must.change. The great myth of social media is that it enables your business to build relationships with customers. Perhaps part of the problem is that the definition of relationships in this social economy is too simplified. Relationships are not a function or derivative of technology. Pursuing the 3F’s of Friends, Fans, and Followers does not directly equate to value. At best, the definition of relationships when technology is at the center of connectivity, can mean nothing more than the way in which two or more concepts, objects, or people are connected, or the state of being connected. Relationships are not static. They are in fact dynamic and becoming more so every day. The sales funnel of the past is now alive and is multidimensional. Connected Consumers emphasize the input of those who define their interest graph – like-minded individuals on any given subject who share common interests and experiences with them. 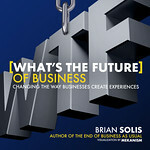 In this way, the connected evaluate the shared experiences of those they trust, and expect businesses to respond to their socialized questions. As a consequence, they don’t follow a linear approach through the classic ‘interest to intent’ funnel during their decision making process. Rather, they follow an elliptical pattern where their next steps are inspired by the insights of others, and their experiences are, in turn, fed back into the cycle to inform the decisions of others. 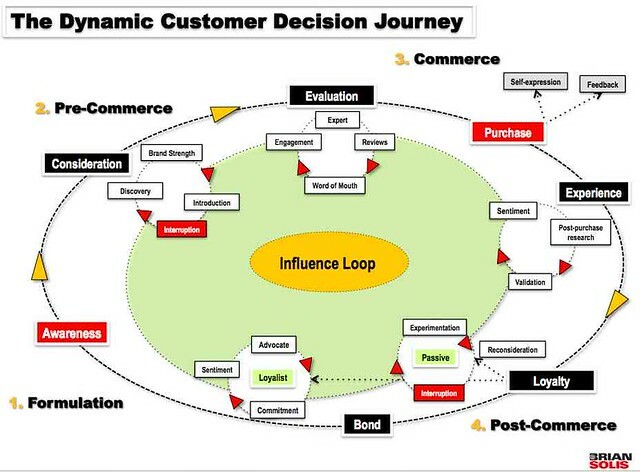 A more sophisticated view of the customer is necessary to move beyond a static view of relationships. It’s time to get informed and emotional about customers. Doing so opens the doors to new touchpoints that are emerging and those that have already surfaced. Then and only then can we redefine online relationships to signify the way in which two or more people or organizations regard and behave toward each other. This is why it’s critical that businesses shift resources away from social media monitoring and make a concerted move toward intelligence. This new listening movement will help businesses better understand who they’re trying to reach and what they value to inspire…well, everything. From marketing strategies to service models to new processes, products and services, intelligence becomes the key to meaningful engagement and ultimately increased awareness and relevance. In fact, I’d go so far to say that you should be as or more excited about intelligence and strategy as you are about Pinterest, Highlight, and all of the hot “it” apps. Once you listen, not monitor, but truly listen to customer activity and observe online behavior, you cannot help but feel both empathy and harmony. Empathy is the secret ingredient in what I refer to as the ART of Engagement. It is the source of inspiring desired Actions, Reactions, and Transactions that means something to all those involved in commerce and relationship models. In many ways, we are right now contributing to the problem instead of the solution. As it is, organizations, perhaps unintentionally, are putting the “anti” in anti-social media. People are equally part of the problem. They are causing disruption based on how they embrace technology and wield its influence online. Over time, it affects all it touches to varying extent. And, often people do not know what it is they want. This is where you come in. The answers lie in intelligence and empathy. Leadership unfolds in how you translate what you learn and feel into appreciation and understanding of the state of customer sentiment and how that correlates to the state of customer relationships. Then and only then, can you imagine and eventually articulate a new vision for what customer relationships and experiences should and will look like and lead the organization in a new and promising direction. This is your time to raise the bar. Someone has to. Brian, do you think that because of social science companies don’t need to ask customers what they want? I mean, perhaps companies believe they can get a more accurate picture of their social customers by analyzing their digital behaviors instead of creating a situation where the customer can manipulate the answers if asked directly? I am kinda inclined to ask the same question as Albert. Off course you should communicate with your customers on a regular basis. Either with the good old focus group or client panel or with a feedback button on your website or even a co creation / collaboration community. But there is also a lot of data that you can get from insight reports. If you analyse the Facebook or Twitter behavior of your fans and followers you can see what kind of content works. One question is “what do you expect” the other is more about “what makes you tick?”. Is just analyzing and social listening/reporting enough or should there always be that offline component? Brian Excellent blog post. Do you realize this conception of actually listening and having empathy actually connects you better with your customer has always been true. Even the old General stores when I grew up realized this concept. As a trauma nurse of 30 years, I have always been able to undestand my patients better and provide what they needed not what they thought they needed, just by listening then reacting. To me it is all about experience. IMHO digital behavior analysis (transactional analytics) cannot provide knowledge, understanding or empathy about customer experience with analogue products and services. It is very informative about digital experiences, such as online and mobile interactions. “Learning from customers” means to me to get as close as possible to “walking a mile in their shoes”, i.e. share their experience. As long as this discussion extends beyond e-commerce and other online businesses, we need go beyond “listening” and start “hearing” what is important to them and how their needs were met in the context of their expectations and their experience. Great post. These days medium trumps the message. The focus is too much on the technology and being the first to use the latest tool in town, without analysing if the message or the medium suits the audience. Having an open mind and be willing to experiment in uncharted territories is something that should be valued. But real success, the kind that lasts, is all about understanding both your audience and your set of tools, and discover how can you use those tools to add value to your audience/costumers experience. I always enjoy your hypothesising Brian, and this blog in particular rings true. My background is Anthropology, the study of how groups of people interact, and this is an invaluable aid in social media management and training. The “cultures” on each social platform are different – what a company can broadcast on Twitter is not necessarily the same as can be delivered on Linkedin. To understand social media, and more broadly to understand “marketing” you need to have an understanding of people – sociology, psychology, anthropology, communication, economics, human geography, et al. Brilliant article Brian! Thanks for sharing this inspiring information. Brian, I so enjoy following and learning from you. This post in particular made me say, “WOW, that’s it!” I have an advanced degree in the social sciences and I think that is why I have gravitated toward social media. I love the research and analytical aspect of engagement but could not do without the equally important social interaction. I hope technology never overrides true relationship building. Thanks! Thank you Brian for writing this important piece. As I was enjoying reading it my thoughts kept coming back to how it defines the personality of the Social Media “marketer” in any business/organization. They must be interested, and if they’ re really good, have passion in learning about their customers/clients emotions and needs, how it affects their business/organization and also listen and follow-through. Interesting “marketing” job description. And now Facebook pages design goes from having lots of pixels for dialogue to having lots of pixels for monologue. So the (few) marketers that want to listen will find their world becoming more silent and the others will go back to sleep again now that the social network turns web 1.0 again. This also brings another issue. “Social science” is not deterministic and is way more chaotic than the traditional “customer management processes” technologies have been used to in the pre-social web. Marketer need to switch from “monitoring the social web” to “discovering it”. You can’t monitor such a chaotic system made up of millions of people interconnected on multiple platforms for different purposes exchanging messages that varies between deep conversations (like your post), short codified tweet, wall comments that have no meaning outside the context of their wall post, Tumblr reaction or Pinterets pins… and summarizing it into a Share of Voice number. This would be like telling “tomorrow the whether is going to be 10” or my health score just gained +2 points… and believing this will be enough to prevent and manage tornadoes or cancers. think this is the right direction … although a difficult one. I guess it sometimes doesn’t occur to execs that all they have to do is ask. They have these amazing channels like Twitter and Facebook where they supposedly “engage” with their community every day, where a decent portion of their followers, fans and customers who want to be heard and contribute to the improvement of a product or service or the company as a whole, … and they completely miss it. Too much focus on content, so-called “engagement” (that isn’t engagement after all) and pretending to build relationships, and not enough on actually building relationships. I see a lot of parroting in the social business space: people not only repeating things they don’t understand but also doing things they don’t understand. I guess they are taught to push this button and pull that lever because “that’s the way you’re supposed to do it.” Increasingly, company employees who interact (and even manage) social media-related functions and activities find themselves doing things without necessarily understanding what it is that they are trying to accomplish or why. Do we need to get to 100,000 likes by Q3? Why? Why do we have to publish three blog posts every day? Why do we need to be on Pinterest? Or Quora? Or Empire Avenue? How do we get more likes and followers? How do we get people to leave more comments on our updates? How will I know if our customers like it? When in doubt, always go back to that. Remove the technology and the processes. Boil it down to just you and the customer (or potential customer). What would you do if they were standing right in front of you? Do that. The rest is just scale. Wow, another nail on the head. As to: “There is no good reason or explanation for why we are not engaging or learning from customers”, I think part of the explanation is that engaging and learning from other people isn’t as easy as it’s supposed to be. Among others it takes courage to become more transparent and vulnerable. “Leadership unfolds in how you translate what you learn and feel into appreciation and understanding of the state of customer sentiment and how that correlates to the state of customer relationships” What stikes me most about this Brian, is the intentionality of this approach. Equally important is the need to, dare I say it, slow down and realize that even with all of the new “it” tools, there is a larger shift that can be better understood by stepping back and not being pushed by emerging tools. Applying what is learned with deliberateness also allows you to choose how tech will serve relationship building. Thanks for this. Cool thing! thanks for sharing. I have never heard about this. “Anti-social media” that has kind of hit the nail on the head. There seems to be a hell of a lot of effort put into monitoring people through automated tools, so as to be able to select the messages to send out and then monitor how many people clicked on the link. The only good things I have had come out of social media tools is when I have taken the time to get to know people through them, surprising that eh? One thing I would recommend for people in this space is to actually go out there and try to engage with a brand you like – see what it is like on the other side.